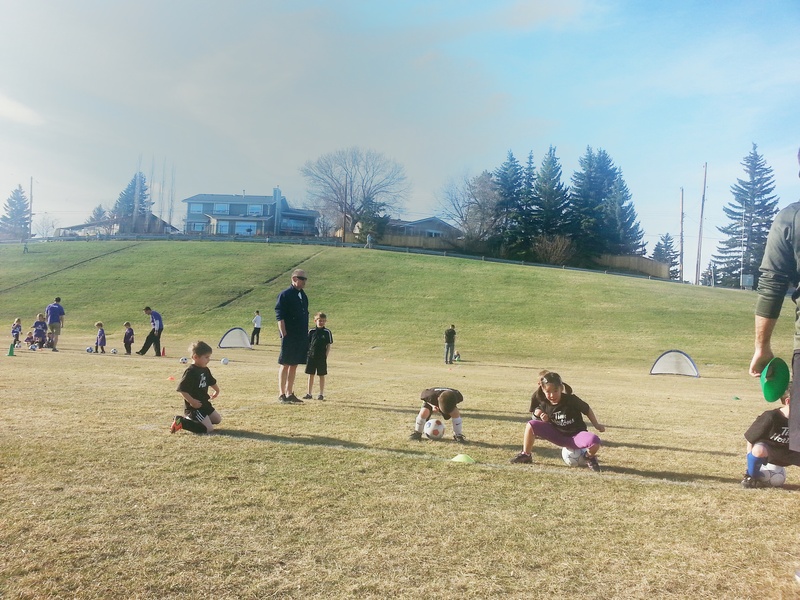 It’s the last week of April (err, beginning of May) in Calgary and that can only mean one thing: outdoor soccer season. With four days of soccer-fun under our familial belt, I can safely say: 1 car, 2 adults, 3 kids in soccer, 4 days of every week…. is not an ideal combination. At least, not for the Johnsons, who pride themselves on their less is less attitude towards the extracurricular enhancement of their wonderboys. But it’s a short season, the older boys insisted they wanted to play and I’m pretty sure Percy dressed in cleats and shin guards is possibly one of the cutest things I’ve ever seen. Which means, for 2014, we are the proud owners of one U10 player, one U8 player and a U6 player. In honor of the madness, I’ve created ‘the soccer door’. 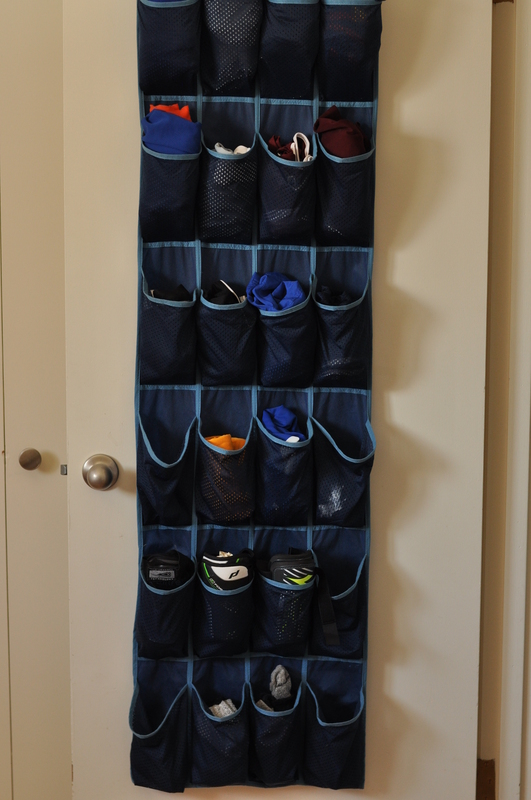 Commandeering an over-the-door shoe organizer (purchased from Target in 2005) and using it as a hold-all for the boys’ shorts, socks, cleats, and shirts. I rarely rise to the (organizational) occasion, but I have to admit this is genius. Much like when I stuffed my family’s clothes in plastic bags last summer. Of course, the only ‘catch’ is you have to wash laundry and put it away. Otherwise you have an empty organizer and people wearing shorts that are 2 sizes too small or kvetching about how they can’t find any [blank]. The professor and I were talking last week about the logistical nightmare that is the next 6 weeks. ‘What if we put Percy on the Hen’s team,’ I suggested. Since the coach of our middle boy’s (rather unfortunate) golden-rod-colored U8 team is none other than the professor. Because we play backyard soccer (sometimes) on a 9 x 12 patch of grass with all three boys and we have vague recollections of Percy tending goal, or at least yelling loudly when someone takes the ball away from him. Our ‘Tuesday-Thursday’, ‘two-brothers-on-the-same-team’ dream died on the spot. ‘Hopefully this isn’t a sign of the Kindergarten report cards to come next year,’ the professor mumbled nervously. 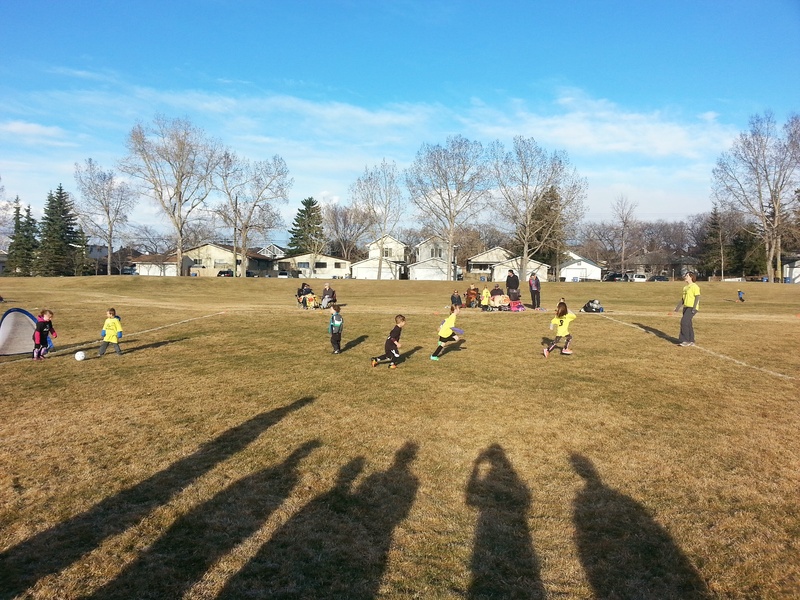 As I discovered last year when I helped coach the Hen’s team, U6 soccer is akin to herding cats. Save the odd superstar, or determined player, you’re trying to teach 4 and 5 year olds with very limited, or should I say ‘selective’, focusing ability about ball handling and passing and not standing in the goal! It’s much like pouring sand through a sieve. They run off the field whenever they want to, regardless of what’s happening in the game. ‘I’m tired!’ or ‘I’m thirsty’ they mutter without so much as a backwards glance at the so-called teammates they’re leaving in the lurch. And their understanding of the drills demonstrated to them is reduced to a vague memory about having to high-five someone at the end of doing….something. On Monday, we eagerly stood on the sidelines and watched our mini-David-Beckham-but with-short-term-memory-loss play against a trio of girls in pale yellow shirts. A trio of very determined girls who, aided by the downward slope towards their goal, managed to clobber the three ‘black bears’ 10-2. On Wednesday, the black bears played against a pale blue team whose coach insisted the 4 and 5 year olds abide by all soccer rules. Meaning every time the ball went out of bounds (which, in a game with players of that demographic, happens about every 1.3 seconds) there was a painfully long pause as they determined which player would throw the ball back in and waited for said player to hurl said ball over his (or her) head, two feet short of the mini-crowd of people standing in front of him. Not that any of them were looking, or ready to receive the ball, mind you. You’re guaranteed a good laugh every time that little black bear is on the field. Right?